In the previous article about Jesus’ use of parallelism, we noted a particular instance of it in John 3:3,5. Our purpose in this article is to understand what that phrase, “born again” actually means. At this point, the parallel is clear, but the meaning is still unclear. It is birth, but not childbirth. It involves water, but it also involves the Holy Spirit. It results in a person seeing, or entering the kingdom of the Lord. But the meaning is lacking. How or when does this new birth happen? At first it seems that “water” is the only parallel, but when we consider that the sword of the Spirit is the word of God (Ephesians 6:17), we see yet another use of parallelism, and realize we are likely getting closer to the meaning of the text. Look also in the last column on the right, to the words “kingdom” and “church.” It is likely these are parallels as well. More on that in a moment. Again, we see the word Spirit in the left column, indicating to us the Person involved. 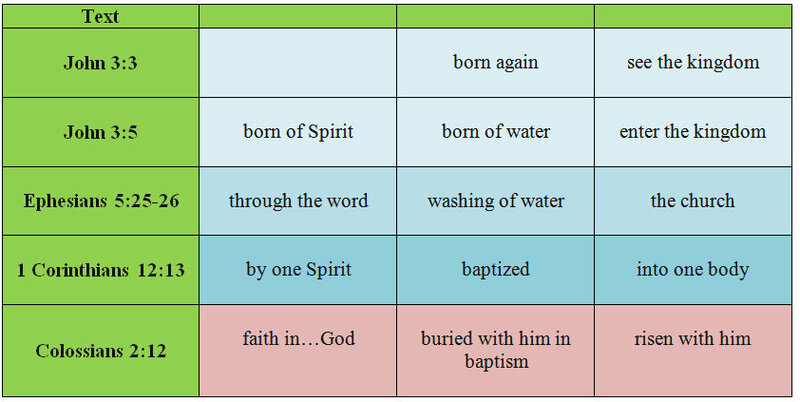 Also, in the middle column, we see a new word: “baptized.” Now, all the parallel terminologies – born again/of water and Spirit, washing of water/ born of water, etc. – have a single word to around which they revolve: baptism. Finally, look in the last column at the terms: kingdom, church, and body. We know from passages like Ephesians 1:22-23 that church and body are interchangeable. They are parallel. We know from Matthew 16:18-19 that church and kingdom are interchangeable. They are parallels – different words used to describe the same thing. In the first column, there is more parallel terminology in the phrase “faith in God.” When we understand “faith” comes through the Word of God (Romans 10:17), which is the sword of the Spirit (Ephesians 6:17), we realize that all these passages say essentially the same thing, from different perspectives. They all describe the process of faith, or belief. In the middle column, baptism is mentioned again, and even its mode is highlighted: burial. In the right column, we see “risen with him [Christ].” In Romans 6:4 this is called “newness of life.” Being raised with Christ, a new life, is another way of saying we are citizens of Christ’s kingdom, members of His body, the church. Every single act of conversion recorded under the covenant of Christ has these features in common as well. There is not one deviation. These passages would supply other parallel terminology, particularly for the far right columns above, words like forgiveness, remission of sins, washing away sins, and such like, showing that entering the kingdom/body/church and forgiveness/remission of sins, happens in conjunction with our baptism. As was mentioned in the previous article, there are other elements to conversion not listed here (grace, repentance, confession, love, etc.). But being “born again” encompasses them all. Most importantly, my purpose was to demonstrate through these parallel terms and passages, that Jesus meant to include baptism as a very part of being born again – in fact, it is the culminating act of the whole process – not something that happens after the fact. One cannot see/enter the kingdom/church/body without being buried and raised with him in the washing of water through the Word.